Room boxes are small boxes designed to hold a single room scale display for miniatures and models. A roombox can be built in any scale, and they are often used to house a display until a larger collection is completed. If roomboxes are designed to standard dimensions, they can be fitted into cases called 'baby houses' which resemble a full-size dolls house. Roomboxes are deeper than windowboxes and usually show one or more complete rooms, including entire one-room shops or houses, potting sheds, and garages. Windowboxes differ from roomboxes in that they usually display only one view of a vignette, and are usually no deeper than three or four inches. Sturdy roomboxes in a range of sizes with or without front glass frames can be easily built from Baltic Birch Plywood, a lightweight finished plywood often available as aircraft plywood from model suppliers. 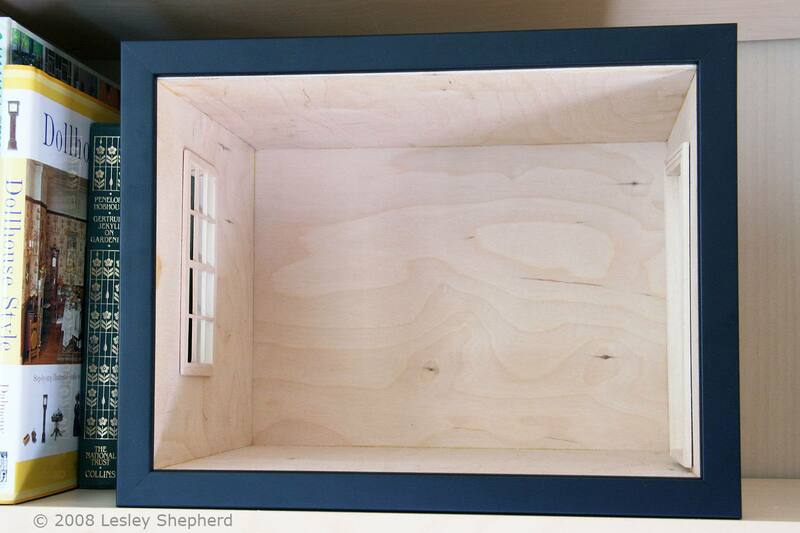 You can use a section of routed plywood to make a channel for a sliding section of glass for the front of your roombox, or you can build standard glass fronted picture frames and hinge them to the roombox front. Inexpensive roomboxes can be quickly built from sturdy paper book board or Davey Board an acid neutral form of card used for the covers of bound books and available from most art supply stores. Bookboard can be used with set in dolls house windows and doors and makes good displays for models and miniatures. It is especially good for school displays where costs must be minimal or for placement inside baby houses, dolls house bookcases, or glass-fronted bookcases, where a collection of simple roomboxes can be used to finish a dolls house room by room. A Breakaway box is usually a bookboard or Davey Board box with one or two hinged sides which fold down to show off a display. They are often used as play settings for children as they are easily opened and stored. If you only want to view a roombox occasionally and like to keep things neatly stored, breakaway boxes are a good alternative to rommboxes, and an excellent way to build a simple miniature collection for a child's play. Like standard roomboxes made from Davey Board, break away boxes can have standard dolls house windows and doors fitted to their interiors. Photo copyright 2007 Lesley Shepherd, Licensed to About.com Inc. Many companies sell inexpensive display boxes to house collectibles. These instructions show you how you can use these boxes (often available from big box stores) to set up a display for small collectibles or a dolls house scene or vignette. As roomboxes are very small, focused displays, you need to get maximum use out of your space. Careful planning, as well as some of the frugal tips on this list, can help you create great displays for less money. This is true of all miniature displays but especially true for roomboxes, where careful design can reduce your costs considerably.